Another week, another Arsene Wenger crisis story. His side’s blunt attack foundered against resolute Blackburn Rovers defending in the FA Cup and they were knocked out by a sucker punch goal. The Arsenal players were booed off at the Emirates and the manager once more invited to ponder his future. It was the second shock cup exit for Arsenal to a northern side beginning with B, after Bradford knocked them out of the Capital One Cup. Wenger had rested key players ahead of the Champions League, but Arsenal should still have been strong enough to get past Championship opposition. Colin Kazim-Richards scored the only goal late in the second half and although Arsenal enjoyed most of the possession, they were unable to create many clear-cut chances. "We lacked ruthlessness in front of goal," Wenger admitted. "We didn't make enough of our offensive corners, and we were vulnerable to one mistake." Wenger said it was imperative that Arsenal did not dwell on the defeat. "It's a good opportunity to show we have character and that we are men who can fight for each other in our next game," he said. "That's all we can do." Arsenal’s hopes of any silverware this season are slim and none and slim may have just left town. The Champions League has eluded much better Arsenal teams than this one and they face the runaway Bundesliga leaders Bayern Munich. Another team beginning with a B are favourites to end Arsenal’s season by February. 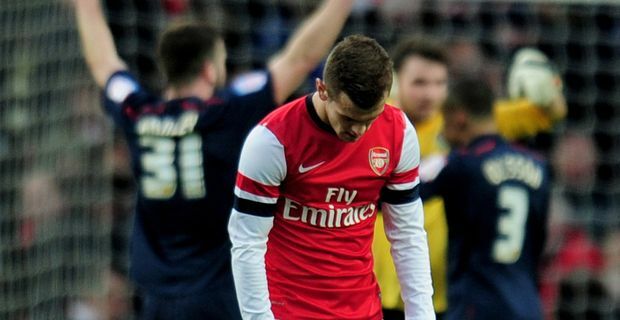 "If we feel sorry for ourselves, we'd be completely wrong," Wenger told his players. "We have a massive game on Tuesday night and we have to show some response after this. I'm very unhappy as well, don't worry, but the season is not over. For people looking in it may be but not for me."